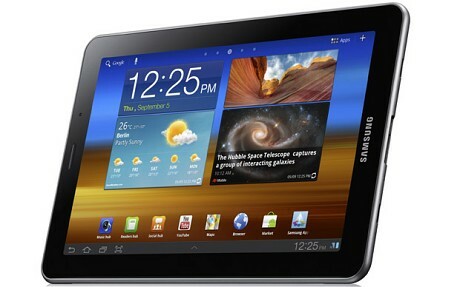 A Dusseldorf court has awarded Apple a preliminary injunction against Samsungâ€™s latest version of its Galaxy Tab tablet. Samsung Electronics was prevented from promoting the new 7.7â€ tablet computer at IFA, one of the world’s largest electronics shows, and has been banned from selling the product across Germany. Samsung and Apple are engaged in an increasingly tense battle over patents relating to the design of the Galaxy Tab tablet computers, while the entire Google Android operating system, which the Tab uses, is also under attack from patent holders. Google recently bought Motorola for $12bn in a bid, partly, to defend Android from such claims. Samsung maintains that the new injunction “severely limits consumer choice in Germany”, and said that it will take “all available measures, including legal options” to preserve its place in the European market. The Regional Court of Dusseldorf has already granted Apple a preliminary injunction against the sale and marketing of the Samsung Galaxy Tab 10.1 across all of Europe except the Netherlands. It is possible to apply for a pan-European injunction in any country which, if upheld, covers all of the EU. The judge initially backed Appleâ€™s claim that Samsungâ€™s tablet had infringed on its intellectual property and copied elements of the iPad 2, but the injunction has since been temporarily suspended. The Australian launch of the Galaxy Tab 10.1 was delayed indefinitely last week after Apple filed a complaint with the Federal Court of Australia.